The Meaco 20L Dehumidifier is a compact home dehumidifier ideal for use in medium and larger sized houses. This dehumidifier includes many useful features and is a light weight and relatively quiet dehumidifier. With a water extraction capacity of 20 litres per day the 20L is twice as powerful as the Meaco 10L Dehumidifier and so will prevent condensation and mould growth throughout a larger area. This is a refrigerant dehumidifier and is best suited for use in the living areas of your home where the temperature will normally be comfortably warm. It is less suitable for continually cool areas, such as a garage or unheated conservatory, for which a desiccant dehumidifier or a refrigerant unit with hot gas defrost, would be more effective. All dehumidifiers make noise, principally from the fan, and also the compressor in refrigerant units. This dehumidifier is less noisy than many comparable models and while light sleepers would not want to share their bedroom with any dehumidifier the 20L will be less intrusive than many others. The 20L is neatly designed with recessed castor wheels in the base, for ease of movement across the floor and a clean, modern housing which will not look out of place within the home. This dehumidifier is capable of unattended operation, incorporating a continuous drainage feature although the lack of auto-restart means that an interruption in the power supply will stop this machine until the user is able to restart it manually. This dehumidifier is relatively new on the market and only a few consumers have written dehumidifier reviews of this product so far. All the signs are promising, however and we expect this dehumidifier to become a popular model for use in the home. 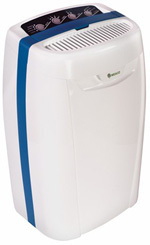 The Meaco 20L dehumidifier is a medium capacity unit suitable for use in the home. For a dehumidifier of its capacity this unit is very compact and measures just 26.4 x 35.2 x 56.0cm. The additional power of this unit is possible because it incorporates larger components which, naturally, add to the weight of the dehumidifier. Nevertheless this unit is relatively light for its class at a manageable 11.8Kg. This is a genuinely portable dehumidifier which can be transferred between rooms using the carrying handle provided or slid easily across the floor on the castor wheels discreetly placed in semi-recessed mountings in the base. The 20L has twice the capacity of the smaller 10L model and will remove 20 Litres of moisture per day from a room, at a temperature of 30°C and relative humidity of 80%. Dehumidifiers extract less water when temperatures are lower or there is less moisture in the air and in the operating conditions likely to be found in most British homes the amount finding its way into the water collection container will be less than half the maximum rate. Typically the water collection container in a dehumidifier requires emptying about twice per day. In this case the capacity of the container is 3.5 Litres, which is an indication of how much water you may expect. If emptying the water collection container is inconvenient you may wish to take advantage of the facility for continuous drainage incorporated in the Meaco 20L dehumidifier. This allows a small bore plastic hose to be attached to the dehumidifier with which the water can be drained as it is collected. The water feed is by gravity alone so it will be necessary to have a drain close to the dehumidifier and at a level below the outlet port of the unit. For best results it is helpful to place the dehumidifier on a surface a few feet above floor level. Humidity control is by means of an electronic humidistat, a device similar in purpose to a thermostat. This device senses the moisture content of air entering the dehumidifier and operates the unit so as to maintain the programmed level of relative humidity. Once this device is set the Meaco 20L dehumidifier is on "automatic pilot" and will cycle on and off as necessary to maintain your preferred level. For personal comfort and to prevent mould growth, deter dust mites and minimise condensation a level of 50% relative humidity is about right. Mould is unsightly and damages items on which it forms but for those who are allergic to the spores it generates it is much more unpleasant. Dust mites are also significant producers of allergens and there is a relationship between the two. Dust mites do not have stomachs as we would understand the word and cannot digest nutrients unless they have been broken down into simpler forms. The main way these nutrients are broken down is, you guessed it, by the action of mould. By tackling the mould we reduce the food supply for dust mites and by keeping relative humidity at or below 50% we make our homes uncomfortably dry for them. In addition to the humidistat the Meaco 20L dehumidifier also incorporates a timer with which the operating time of the unit can be set up to eight hours ahead. The timer, the humidistat and all other functions of the unit are accessed from an electronic control pad which makes the unit simple to use, even for those unfamiliar with dehumidifiers. All this power and a comprehensive range of features come in a small, light package that, by dehumidifier standards is quiet. The noise output of this unit is just 46dB. Taken together the features and performance of the Meaco 20L dehumidifier make it a capable and desirable unit which, while not the cheapest on the market represents good value for money. As this is a dehumidifier new to the market dehumidifier reviews by consumers are very few so far and we would not wish to draw any conclusions from such a small sample. With so few dehumidifier reviews to draw on it is too early to make definite statements about this dehumidifier. Looking at the excellent features offered by this dehumidifier, especially its low noise output, light weight and compact size, if it lives up to the standard of other Meaco Dehumidifiers it will earn its spurs and be an equally popular appliance. Taking what we know so far the Meaco 20L Dehumidifier offers good value for money and is well worthy of consideration. We await further consumer reviews before making a final judgement.